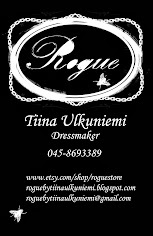 There is still few more days be be part of the Rogue 1st birthday give away. The draw will be done on 10th of December. I will call out the winner in Rogue Facebook page so that I'll be able to get the address for the shipping from the lucky winner. It does not matter where you are from so anybody can join. Insect necklace, long chain cross earrings and bird skull hair clip. Few simple rules to join the lottery to win this birthday give away. 1. Become a reader to this blog. 2. Like the Rogue Facebook page. 3. Share this post/blog in Facebook. Last week I made all these new hair fascinators. They are all for sale and they are 25 € + shipping a piece. They have two hair clips underneath so that they stay in your head securely. They are all slightly different yet almost the same. Little bit of hand made roses and little bit of black feathers makes every outfit perfect for cocktail party.